Joseph “Joe” Bergin was born in Winthrop, a small suburb of Boston, Massachusetts, on September 26th, 1924. After graduating from high school in 1942, Joe’s father sent him to a military school in Wayne, Pennsylvania as a 2 year junior college. While there, several of Joe’s friends and himself enlisted in the Army. At that time, being 18 years old, all of his friends were going into the service and it was the thing to do. Joe was sent to basic training in Camp Wheeler, Georgia, for about 4 months, and after this to an embarkation point in Hampton Roads, Virginia, for a boat trip to Casablanca in Africa. This was in July, 1943. The ship had been an ocean liner, “The Empress of Scotland.” The ship was packed with soldiers who were to be replacements. It was explained that the ship was alone, and that it would be continually changing course to avoid possible submarines. Joe landed at Casablanca about 6 days later. Through truck rides, train rides in the 40/8 box cars (train wagons that could carry 40 men or 8 horses) to different camp sites, the men finally left from Bizerte, to Sicily. Here Joe got assigned to F Company, 47th Infantry Regiment. The Sicilian phase of the war was ending and although Joe received credit for a battle star, he says “he really only just heard guns, some artillery and did some taking of German prisoners”. Otto Geyer was the Captain of F company at that time and they were camped at the base of Mount Etna. The time in Sicily was spent training and hiking in the mountains, with the expectations that Joe’s Regiment would be going to Italy, as things were not that good for the Americans. Finally he left Sicily in a huge convoy of ships, in November 1943 and landed in Liverpool at the end of November. Then the Division was split into the different areas, but all were based in Winchester. E and F companies, 47th Infantry Regiment, were assigned to Alresford, a few miles from Winchester. Joe was here until D-day. Men of the 9th Infantry Division getting briefed in England before going to Normandy. Joe Bergin is the soldier just left of standing General Eddy’s hand. The 9th Infantry Division did not participate in D-Day because they already fought in 3 previous campaigns, so Joe then arrived in Normandy on D-Day + 4, June 10th, 1944. He fought in various battles here, and was there when on July 25th, 1944, Allied bombers dropped their bombs on their own troops at the St. Lo – Perriers Road. From France he went to Belgium, on to Germany and participated in the penetration of the Siegfried Line and several battles in the Hurtgen Forest. Joe was one of the soldiers who attacked the Frenzenburg Castle. After being wounded, he was taken off the line, to return again in March 1945. Joe remembers vividly crossing the famous “Bridge of Remagen” right before it collapsed. 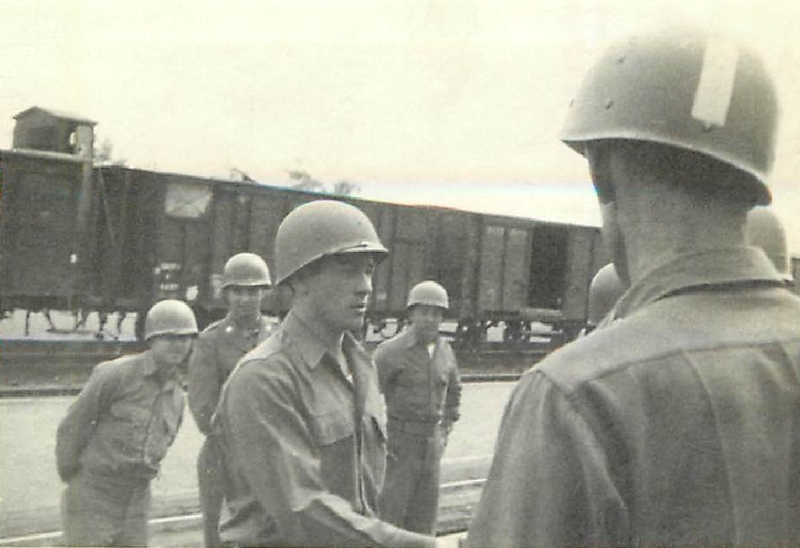 Joe Bergin being awarded the Bronze Star medal in May 1945, near the Dachau camp. 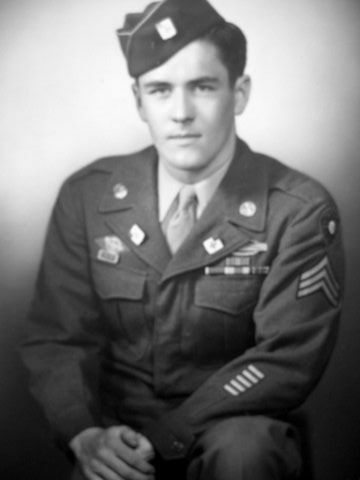 When the war was over, the 47th Infantry Regiment was stationed in a German town, Scheyern, which was in the Munich area, and thanks to the “points” system, Joe had enough points to return home in August 1945. Joe has 6 of the 8 Battle Stars. Shortly after being home and seeing his parents and girlfriend at the time, it was time to apply for college. Joe applied and was accepted to Holy Cross college, a well known college in Massachusetts. He graduated 4 years later and got married his wife Isabel on the 25th of June, 1949. My friend Joe then lived in New Hampshire. After he “retired”, he loved to play golf, helped out at the local hospital as a volunteer and was still working in real-estate. Joe has become a good friend to me, and I was pleased to hear that he was awarded the French Legion of Honor Medal on November 17th, 2010, the highest decoration in France, only given out to veterans who helped in the liberation of France during World War 2. A proud moment! I can’t thank my friend Joe enough for all the information about the 9th Infantry Division and his own experiences he has shared with me. Joe was the first veteran to put his trust in me, and his support and help has been a great inspiration for me in writing my book and creating this website. Over the years we have been in touch a lot, and he is a big inspiration for me in my research. He would could me “The Young Reliable”, as a joke to the nickname of the 9th Infantry Division, “The Old Reliables”. My dear friend Joe passed away on July 30th, 2015 at the age of 90. I still miss him every day. This nice article was written about him after he passed away. I will never forget Joe.